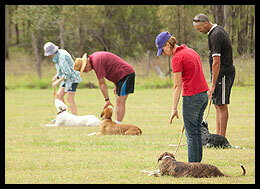 Book your place in our next dog obedience training course online. Our Obedience Training Courses for dogs are popular, so please book in advance to avoid disappointment. 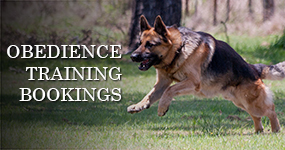 For a full outline of the training course, please refer to our Obedience Training page on this website. Our Course fee is payable on the first day of the course. 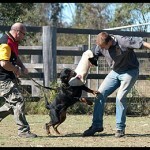 This is a one time, flat fee for training in Obedience at Aylwards Dog School. You may enroll more than one dog for the same course, however, please note that each dog must have the same handler throughout the duration of the course. Do you have a Ipswich City Council Registration Rewards Program Voucher? 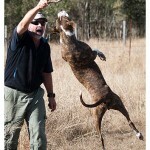 Please NOTE: At Aylwards, we start training dogs over the age of 6 months. We are happy to accept your application now for your puppy and schedule your training course to begin after your puppy reaches 6 months of age. Would you like to subscribe to the Aylwards Newsletter to recieve the latest news from Aylwards? Enter your email address below to receive updates on new course dates or training tips! Enter your email address below to receive updates from Aylwards Dog School about pet health & training! © 2019 Aylwards Dog School | Ipswich & Brisbane. All rights reserved. Webdesign by Teale Shapcott.